The birthstone for June, the third and thirtieth wedding anniversary gem, the symbol of a happy marriage, the emblem of purity, chastity, and modesty... The pearl is the perfect piece of jewelry for any occasion. When choosing pearls there are a number of things to consider besides just the quality of the pearls. While there is no right or wrong way to chose pearls, here are a few tips you should consider. 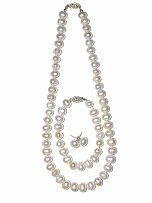 Necklace Length - You can buy Pearl Necklaces in a number of different lengths. Generally speaking, shorter necklaces flatter long necks, while long necklaces are nice for smaller necks. The lengths and names are as follows. The most popular is the Princess length since it is a good length for both long and smaller necks. Pearl Color - The pearl color does not affect the value of the pearl, instead it is completely in the eye of the beholder. Most people buy pearls that best match their skin tone. People with light skin usually buy white or pink pearls while people with darker skin tones tend to buy black or lavender pearls. In America, white pearls are the most popular, while in Asia, silver are the most sought after. Pearl Sets - When buying Pearl Jewelry you should consider if you want an entire set, or just a certain piece. If for instance, you buy the necklace, and then later decide to buy the bracelet / earrings they may not match as well as if you had bought a set. Even if you buy the same size, and color, the style may not be the same. Some stores will allow you to buy the individual pieces of a set. So if you want to buy the other pieces at a later time, they will still match.